Make banking more enjoyable for consumers while making your own job as a financial marketer more fun for yourself. This is the biggest list of marketing ideas you’ll ever see. Folks say banking can’t be fun, and some go further and suggest financial institutions shouldn’t even try. The Financial Brand says phooey to that. Consumers hate banking — it’s a burden, a chore. But you’ve heard the expression “time flies when you’re having fun,” so why not make banking fun and help consumers get it over with faster? True, the mechanics of banking are largely fixed — difficult to change and hard to transform into a fun experience (sucky things like math and bills are involved). But that’s where marketing can step in. Here’s 101 ideas for you, broken into four pages. 1. Put comedy routines into your on-hold messages. People hate waiting on hold because usually pre-recorded messages are cold, canned rhetoric — “Your call is important to us. Someone will be with you shortly. Thank you for your patience. Do you need a new auto loan?” Ugh. Fun brands entertain callers that they have to put on hold. You could tell people the same things you normally would, you could just do it with some personality, style and flair. Southwest Airlines had an on-hold routine loaded with humorous bits about low fares, fun destinations, baggage fees, etc. It actually made sitting on hold a pleasant experience. In fact, some callers would ask to be put back on hold so they could hear the punchlines to some of the jokes! 2. Put Easter eggs on your website. An Easter egg is an intentional inside joke, hidden message, or similar feature — a surprise bonus, something that’s fun to find. For instance, loyal customers of In-and-Out Burger know there’s a secret menu. Coast Capital Savings used to have a virtual greeter named “Julie” on their website who would answer questions from users. If you asked about “checking accounts,” it would trigger a video response from Julie. But if you asked Julie to tell you a joke, she would. These days, video game designers know that Easter eggs are mandatory in every title they release. Take a page from their gamification playbook and hide some fun little gems on your website. 3. Put some fun into your ATM receipts. 4. Poke fun at your disclosures and compliance jargon. To make banking fun, you need to be an imaginative student of gamification. As Jim Bruene at Netbanker suggests, you can create a program that allows your customers/members to play financial games and keep score against themselves and peers. They can earn points, honors, badges and discounts for credit-score improvements, savings gains, debt reductions and other measures of financial fitness and goal achievement. Get people to explore your online channels (e.g., website, Facebook) with a scavenger hunt. Ask participants to find the answers to five questions. This is a great way to get people to poke around a relaunched/redesigned website. One credit union did this and doubled their web traffic. There are all kinds of ways to have fun with “lost” wallets. Get some branded wallets, load them with coupons for your financial products, then drop them around various public locations. You could put cash in them, with a little note from the CEO. You could put clues for a scavenger hunt or trivia game inside. 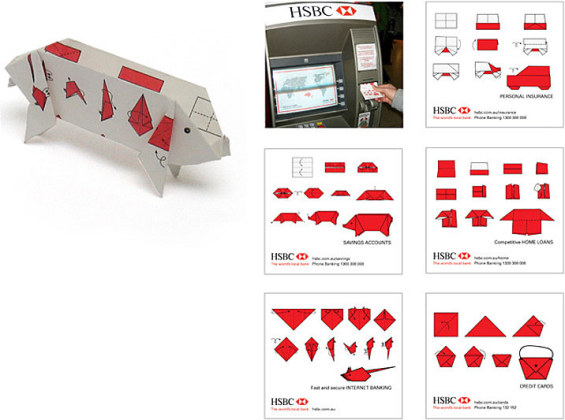 Or you could make them resemble a real person’s wallet, then film how people react when they find the wallets? Do they return the wallets? Do they keep the cash? Randomly swap out a few $20s with $50s or $100s in one ATM (or more). To get the biggest bang for your buck, announce when, where and for how long the ATM(s) will be loaded with bonus hundreds, then alert the press. That’s what Industrial Credit Union did when they wanted to draw attention to a new branch location they opened. 9. Have employees tell jokes. 10. Exploit a pop culture meme. Cultural fads make great marketing fodder. Back in 2008 when the “LOL Cats” meme was a viral phenomenon, one credit union gave away cheeseburgers to college kids who opened new accounts, using a photo of a fat cat with the headline, “I can has cheezburger?” Every now and then a dance routine like the Harlem Shake comes along. Fun banks and credit unions will perform their own rendition and share it on YouTube. 11. Make your recruitment ads fun. 12. Poke fun at your competitors. There’s nothing like getting dumped. On Valentine’s Day. That’s what NAB, one of Australia’s four biggest banks, did to its rivals Commonwealth, ANZ and Westpac. Using an elaborate mix of marketing media, NAB announced that it would be “breaking up” with its competitors. The day after Valentine’s Day, NAB delivered an open letter to competitors that reads like a Dear John letter. NAB said it had “moved on” by abolishing fees, offering better interest rates, improving access to ATMs, and supporting local businesses when other banks wouldn’t. The lengthy “break up” letter was published in every major newspaper. You don’t have to go quite as far as NAB. 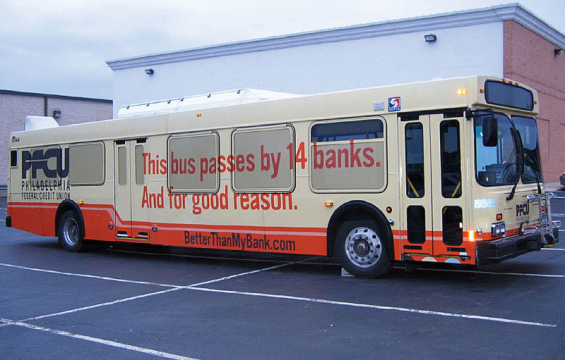 You can just come up with a witty headline, like PFCU did below for this bus wrap. 13. Develop an interactive game. BB&T, a regional bank in the U.S., promoted leadership skills in a game for iPads, iPhones and other mobile devices. And Barclays in the UK built 56 Sage Street, which is perhaps the single best online interactive game ever developed by a financial institution. 14. Be a student of fun brands. Eastern Bank hid some GoPro video cameras in secret locations around their market, then gave consumers clues to find them on the bank’s Facebook page. It earned the bank some great free press, and spiked traffic to their website by 20%. 16. Make a billboard out of dollar bills or loose change. 17. Have fun in your drive-through lanes. Michigan First Credit Union asked members in the drive-through lanes at one of its branches if they would like some entertainment. Those that said yes were treated to a dance routine from seven high school aged performers who boogied down to C&C Music Factory’s hit “Gonna Make You Sweat (Everybody Dance Now)” around their cars. Then on another day, those who wanted their drive-through “entertainment” got treated to a free performance from a mariachi band. A flash mob is a group of people who assemble suddenly in a public place, perform an unusual act, often a dance routine or musical performance. Here’s one that Wells Fargo did in Times Square back in 2011. 19. 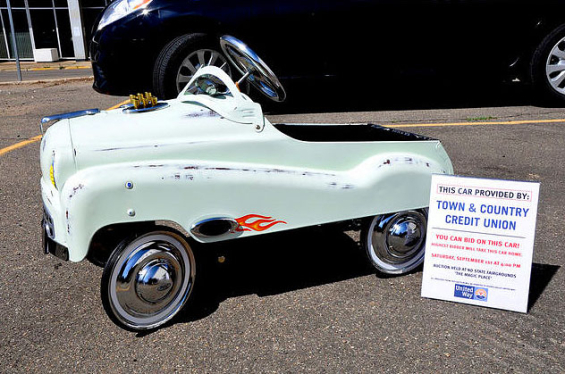 Use toy cars to sell auto loans. Put a miniature toy-sized kid car in your branch parking lot. You can use either a vintage one from a second-hand store like Town & Country Credit Union (below), or you can pick one up at Toys-R-Us. Chain the thing to a bolt stuck in the concrete if you don’t want to see it disappear. Then put a sign next to it about your current auto loan promotion/rates. Every single person who walks by will stop to check it out. You’ve probably heard the expression, “Money doesn’t grow on trees.” Well in Australia, that doesn’t seem to be the case, where one bank placed a tree full of $5 notes in Syndey’s Fleet Park, then used hidden cameras to record people’s reactions. You’d think people would mob the tree and strip it bare, but they didn’t. Summit Credit Union repeated the stunt in 2010 with similar results. It’s a fascinating psychology experiment that yield great PR opportunities. 21. Reward desired behaviors with fun prizes. You’ve heard the expression “you get what you give.” That’s how it works when you want people to change behaviors. If you want someone to take action or do something differently than they have in the past, you’re going to have to incent/reward those behaviors. For instance, if you’re launching mobile check deposits, build a promotion where some winner(s) win “Double Deposits.” If you want to increase credit/debit card activity, create a promotion where you randomly select and pay for purchases. If you want people to change ingrained habits, you’re going to have to make it fun. 22. Send your competitor a message. Coast Capital Savings asked people to sign a giant 8′x10′ greeting card that “congratulated” big banks for the $3 billion in fees that they charge Canadians annually. The Canadian institution had their “I Love Fees” street team collecting signatures on the mock greeting card at various public locations. Cash mobs play off the idea of flash mobs, but instead of performing a song and dance routine, a group of folks get together and flood a local, independent business, each ready to spend about $20. A number of financial institutions are having fun with cash mobs, which help position them as supportive of small businesses. Here’s a great gag from NAB, the undisputed king of guerilla marketing in the banking world. Luke, a typical consumer, strolls through the local mall on a sunny afternoon when he stumbles upon a pair of football tickets apparently lost by another shopper. Luke takes the tickets to the nearby “Lost Property” desk. “I found these laying on the ground over there,” he explains, handing the tickets over. “Luke,” he says. Moments later, as Luke continues his stroll through the mall, he sees his name and face plastered everywhere — on posters and video displays. He’s even on the news. “Is this the new face of honesty?” asks one poster sporting Luke’s photo. A massive 20-foot display in the center of the mall screams, “Thanks for your honesty!” As if that weren’t enough, a baker inside the mall has decorated a cake in his honor. “Honest Luke,” it says in blue, sugary letters. The campaign stressed the bank’s integrity and approach to financial matters, with a particular focus on a new credit card with no strings or hidden fees. 25. Random acts of kindness. In the spirit of the film “Pay it Forward,” send street teams out to perform guerilla good deeds for unsuspecting citizens in your community. You can pick up the tab for a family’s dinner, or surprise a local fire department with a free lunch, or pay for someone’s gas.